Not only will XSEED provide the localisation of Pandora's Tower in North America this year, but it also plans to bring RPG title Rune Factory 4 to the 3DS later this year, with the aim of a summer release. The game will be the first in the series which allows the player to choose either a male or female protagonist. Aside from the usual dungeon crawling and monster hunting, players are able to fall in love with a partner and start their own family together. Crafting, cooking and farming duties keep you busy when you want to take a break from the main quest. The title released in Japan in July 2012, and there has been no mention of a European release. US readers, are you happy to see XSEED publish the game? Let us know your thoughts. I was expecting them to publish it, it was more a matter of when. And it's not really a hard choice for me, as I like Rune Factory better than Animal Crossing. Ain't got time for this game or Harvest Moon with Animal Crossing coming our way. Sadly. Oh heck ya I'm happy about this. I'm thrilled! I've logged more than 200 hours in Rune Factory Frontier for Wii. Well, this is quite a surprise. I would have thought that Natsume would be the publisher as was the case with all previous RF games. Strange. Not that I'm complaining, of course! I've been looking forward to its release ever since it was first announced for Japan! Hurray! Been waiting for this news for forever! I don't know, do I want this? Also, I'm really not getting what all the hype is about Animal Crossing. and don't pull the "You've never played it then" BS, I've played Wild World. It was ok, but definitely not anything to celebrate about. From what I can see, this game is better than New Leaf anyway. That being said, I still don't particularly want it. @TheLilK98 To be fair, this is a game you have to play to understand. Like, half the fun for me comes from planning out how I'm gonna do things, since time is a factor in Rune Factory games. Do I spend time in the Dungeon, or do I water my crops? How many crops should I plant, and which ones, so it won't take too much time away from dungeoneering, yet will still make me a profit? Granted, there are different ways to play and tons of different aspects to like. It's also more varied than Animal crossing, in a way. It's not for everyone, but I'd at least look up long gameplay videos, preferable playthroughs, so you get an some idea of what its like to play the game. Like others have said, New Leaf will be released soon, so diving into RF4 as soon as it releases sounds like a terrible idea. I'll definitely pick it up after I'm done with New Leaf. Which will be a year after it releases. I thought Animal Crossing was coming in April? Did I miss something? Did Nintendo announce a release date? @CanisWolfred Thanks, I'll look into it. @CanisWolfred @Chrono_Cross Are you guys in Europe? I'm pretty sure in the states we get it like this month or something. XSEED, I support your company 100% thanks for doing what others don't!!! @Chrono_Cross Good luck being "done" with New Leaf, or any Animal crossing for that matter. @TheLilk98 If you like sim games (especially Harvest Moon) or dungeon crawlers you'll probably like Rune Factory, on the other hand if both strike your fancy your in for a real treat. Can't wait been anticipating this one for a long while now. Kinda strange since Natsume usually publishes the DS versions, but hurray for XSEED! Now I just need to finish my second play-through of RF3. I was going to ask someone to explain this series to me but CanisWolfred kinda already did the. If you are still watching how would you rate this series as I've never touched one of the games? @Tech101 The series has its ups and downs. I've only played Rune Factory Frontier on the Wii (9.0/10), RF: Tides of Destiny on the Wii (6.5/10), and Rune Factory 3 on the DS (8.5/10). It's very fun and heavily addicting. Most of the elements come together well, and replay value in impossibly high. My only qualm is that Natsume does a sub-par job with localizing the series (dry scripts and downright terrible voice acting), which is why I'm glad XSEED got ahold of the game. I also kinda like it on consoles more, but it's not that big a deal. They still play the same, I just get hand cramps if I play the game on a portable for 4 hours at a time...which is pretty easy to do. @caniswolfred: that's interesting, because i much prefer my HM/RF games on handhelds. it just feels more immersive to me. anyway, i am one happy camper hearing this news! i will get both RF4 and Animal Crossing...i tend to play AC in bits and bobs thru the day whilst i play RF/HM games for hours at a time when i am able. now if we can just get a true release date for A New Leaf it would be icing on the cake. Actually, Rune Factory: Tides of Destiny allowed you to choose your gender, too. But I didn't get that one after the horribly slow paced Frontier, so I'm eager for this feature in the much more awesome handheld installments. @k8sMum I know I'm in the minority there, that's for sure. I got mixed answers about the 3DS regon lock. some say its only for 3DS games, others say it affects DS games as well. Since i still need to get RF3 (which, to my knowledge, never came to EU) will a US copy run on my EU 3DS ? Back on topic: I like RF (and Harvest Moon in general) a tad more than Animal Crossing because you have an objective. Sure, you can set your own goals in AC, but i often sat there, running in circles thinking to myself "and what now ? bought everything important, got enough bells, fish and bugs..."
Does XSEED actually get profit from these games that they publish? @TheKingOfTown Sometimes. It helps if you actually buy the games new. @CaptainMorpheus Okay...all of us seem to want it. Why are you embarassed? @CanisWolfred Well obviously. I was just wondering, since it sort of seemed unlikely. @TheKingOfTown They've been in business for about 8 years, last I checked. Surely they must be making some money. Thanks for your opinions on the series CanisWolfred. I definitely have to check it out since I'm loving my 3ds and all the rpgs coming out on it. It's about time too. I hope we have as many rpgs as the ds got!! This, Monster Hunter, and Fire Emblem Awakening are going to increase my 3DS usage by 200%. 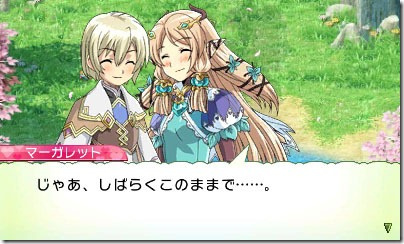 Anyone know if Rune Factory 4 has online co-op? I'm still waiting for a good co-op game. Heroes of Ruin was good but something new is in line. I'm guessing an eShop release ala Unchained Blades. @brandonbwii Why? This series doesn't do that badly. It's one they've handled before and it worked out well for them. @Windy There's no online co-op. It wouldn't need it, anyways. It's more Harvest-moon-in-a-fantasy-setting-with-some-dungeon-crawling than a full-on action-RPG. Does anyone know if you can have same-gender partners? @Azikira the only thing i was wondering was who was going to ask first. It never fails when a Harvest Moon comes out. @Azikira Since I haven't seen anything to suggest that you can, I'm going to assume you can't. @Azikira The only Harvest Moon that did that I'm aware of is Harvest Moon DS Cute complete with baby adoption (the DS game's girl version) but I think that was removed for the US version (or changed to "best friends" I can't remember which). @Flowerlark I didn't play ToD as much as the others, but I don't recall being able to choose what gender I was. Not at the beginning, at least. NO! Give me Medabots 7! @Einherjar The region lock for DSi games only comes into play when there are DSi features being used in those games (i.e. camera). Since RF3 doesn't use any of those features, it should work just fine. Yay! I'm really looking forward to this. @Einherjar The 3DS can play DS games from other regions, but not 3DS games, (at least for the North American 3DS. Perhaps EU 3DS is different?) I've imported European DS games and have had no problem playing them on my 3DS, (aside from not being able to select the language I want, lol, but that is an irrelevant issue if you just want to play in English). Edit: Ah, I wasn't aware of the DSi restrictions mentioned above! @Azikira From my understanding, you can unlock an option to change your character's appearance to different characters, (including male/female protagonist). So you could play as a male who looks like a female, and marry a female character for example. Here's a link to the forums where I read about it: http://nisamerica.com/forum/viewtopic.php?f=9&t=5356&sid=1486f7a1bd056cfa024481f4845d1b0c&start=120 (There may be spoilers). Thanks, guys. I'm just glad we're all mature enough here to not judge same-gender relationships so harshly. Yes. I've been waiting for a 3ds version to try out the rune factory series. Keep the 3DS rpg train going. Might get this, Liked the last one. The farming element is not as good as Harvest moon, but the battle makes up for it.